Tasman Glacier Down Under. Credit: Martina Ulvrova (distributed via imaggeo.egu.eu). The Tasman Glacier Terminal Lake, seen in this photograph, lies in the Aoraki Mount Cook National Park in New Zealand’s south island. The photographer, Martina Ulvrova, stated she “finally got to see the largest glacier in New Zealand after several days of heavy rain, during which the landscape was bathing in mist”. The Tasman Glacier is 23 km long and is surrounded by a terminal proglacial lake with floating icebergs. The lake was only formed in the 1970s by the melting of the Tasman Glacier. Today the lake is 7 km long and growing faster than ever with its length that is increasing by approximately 180 m per year on average! This continual lake growth is largely due to the receding glacier which has been retreating since the 1970s and has shrunk by approximately 6 km over the past fifty years. Blocks of ice regularly break-off the flowing glacier and float peacefully on the lake. One can see only the tips of these enormous icebergs with about 90% of the iceberg mass hidden below the surface of the water. In 2011, after a 6.3 magnitude earthquake, 40 million tonne chunk of ice broke away from the Tasman glacier and plunged into the lake. The collapse of the gigantic block caused a local tsunami with waves as high as three meters bouncing from side to side across the lake for thirty minutes. 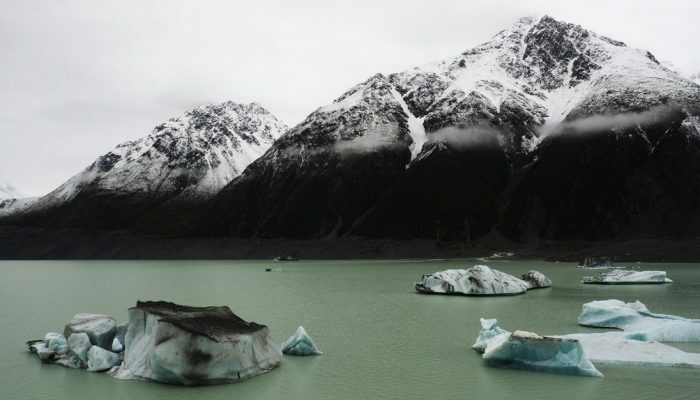 Scientists expect the Tasman glacier to continue shrinking considerably and warn that it is likely to eventually disappear. Global warming has hit this secret paradise and predictions are alarming.